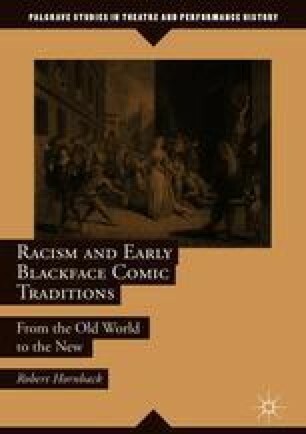 Shakespeare’s complicated influence on cultural understandings of racial stereotypes across the Atlantic is the focus of this chapter, which looks in detail at the development of so-called early blackface in what was actually a very late period in the history of blackface comic traditions, that of antebellum America. In an era in which Shakespeare’s plays accounted for a quarter of those performed in America and in which Othello was spoofed in more minstrel parodies than any other play, Renaissance English again became contested ground for the representation of “blackness.” The African Theatre, comprised of free black actors, was attacked when its stagings of eloquence threatened white attempts to reify stereotypes of black inferiority. Minstrel burlesques and satiric accounts of the company’s endeavors, and particularly the use of broken English to mimic–and stereotype–them, recall the proto-racist strategies uncovered in previous chapters. Yet, the contrast between “white-washed,” light-complexioned Othellos in serious drama, a more stereotypically “black” Othello in minstrel parodies, and the African Theatre’s employment of Othello’s eloquence as an assertion that, as its abolitionist star performer put it, “Shakespeare is our Bard as well as yours,” poignantly underscores Postcolonial criticism’s finding that “Shakespeare” has meant different things in different contexts. Though Othello may seem unabashedly racist to many modern scholars and actors, Othello’s eloquence long presented a challenge to white supremacist assumptions.